When the weather turns warm, many activities get moved outside. The season for outdoor picnics and cookouts is upon us. If you have never had an outdoor feast, now is as good a time as any to start. There are variations on outdoor cooking all around the world. In the U.S, it is often referred to as barbecuing. Barbecuing with charcoal is considered to be the best because the charcoal adds a smoky taste to what you are making. It's that extra bit of flavor that is difficult to get from cooking in a traditional oven. However, some people prefer gas powered grills since they are easier to use and clean up afterwards. Where can you have a barbecue? 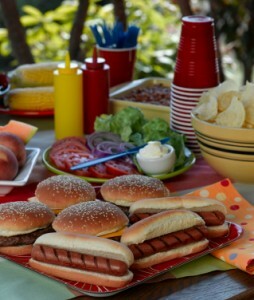 Parks, backyards, and beaches are the most common places to organize a cookout. Some of us are lucky enough to own or know someone with a full-sized grill, but portable charcoal grills are fairly inexpensive and work reasonably well. The first rule of using a portable grill is to be careful. Follow the directions that come with the grill and charcoal, and stay away from low-hanging branches. Once you have the heat going, it is time to cook. When most people think about grilling outdoors, they imagine hot dogs and hamburgers. Those foods are undoubtedly great, but the best barbecues will include lots of non-meat options as well. Peppers, asparagus, and corn are all great on the grill. As you are eating, you will surely get thirsty. Soda, lemonade, or iced tea are great choices at a barbecue. Beer can also be enjoyable but if you are planning a cookout at a park or other public place, you must first make sure that alcoholic beverages are allowed and legal to consume. Warm weather is ideal. Outdoor cookouts are most popular during the warm late spring and summer days. Many cookouts are planned around a holiday: American Independence Day, Memorial Day, or Labor Day, to name a few. If you are planning a cookout in a public place like a park or beach that has grills and picnic tables available, be prepared to get there early to stake out your space as the crowds will form very quickly. Finally, be sure to invite as many guests as possible! Cookouts work best when everyone contributes something, whether it's a side dish, food for the grill, desserts, paper plates and napkins, or drinks. And obviously the more friends that come the more fun you will have. If you plan to host a summer barbecue or cookout, use the following checklist to make sure you'll be ready!